Progress rarely happens if it is not subjected to a complete review, and full assessment of outstanding projects, tasks, and the next actions you must take. I know that most of you do agree with such a statement, but few actually act on such principles. Take for example the process of getting a Real Estate Listing, applying the right marketing techniques to it; designing a pricing strategy for it; planning the ongoing conversations with the Seller; and all the procedures a good Real Estate Agent must undertake. This an example of a Full Project; it has an arc of existence; a beginning, a middle, and an end – yet few agents add the component of ‘project review’ say every 2 weeks for every listing. 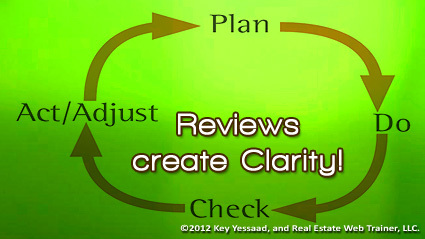 I promise you that if you chose to undertake reviews you will not only find missed communications that could come back and haunt you later; assumptions of processed tasks that have not been done and could cause you agony; but best of all opportunity hovers when reviews are done – clarity creates opportunity, and project reviews provide for the existence of clarity in your life – try it!